There are four Screen color options on the Status display, adjustable in the first Settings menu, under Screen Color. The information layout on the Canon T3i is somewhat different from that on the T2i, although the color choices are unchanged. I found myself preferring the default color scheme (top left in the group of shots above) in the daytime, thanks to its strong contrast. Color scheme 4 (bottom right) was similarly useful for shooting at night, reducing the contrast just slightly so as not to tire my eyes. 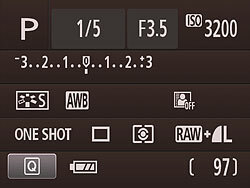 The rear-panel display on the Canon T3i is also used for Canon's Quick Control menu system, first introduced in the Rebel T1i. As with the T2i, there's a Quick Control button dedicated to entering the Quick Control menu. Regardless of whether the LCD display was active or disabled, pressing the Quick Control button on the Canon T3i while in capture mode will take you to the Quick Control menu system, where you can adjust various settings shown on the rear-panel display. You navigate between the various setting options with the arrow keys, and the chosen setting will be highlighted as shown above. Once a setting has been selected, you can change it either by rotating the Canon T3i's Main Dial, or by pressing the SET button, and then using the arrow keys to choose from the available options. 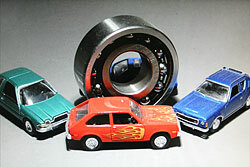 The Quick Control menu is dismissed with a second press of the Quick Control button. Pressing any of the arrow keys to the right of the Canon T3i's LCD screen (if available in the current exposure mode), or the Set button while making changes in the Quick Menu, immediately brings up a screen for the exposure parameter associated with that button. Once the option screen is displayed, you can use either the arrow keys or the Main Dial to scroll the cursor highlight through the options presented. You can continue to press the same arrow-key button, or turn the Main Dial in the same direction, and the highlight will scroll through all the options, wrapping around when it gets to the end of the list. When you've made the choice you want, pressing Canon T3i's Set button confirms it and returns you to the main shooting display or Quick Menu, as appropriate. Like the Rebel T2i, the Canon T3i shows each image as it's captured, though you can turn off this function through the Record menu. The display mode in Record Review defaults to the same as was last used in Playback mode, or you can hit the Display button to cycle to a different mode. Likewise, in Playback mode, you can cycle between the available display options by pressing the Canon T3i's Display button repeatedly. (Display mode selection is persistent across both record and playback modes, no matter which mode you make the selection in.) You can also select between the normal luminance-based histogram and the RGB histogram option via a Playback-mode menu item. The screenshots below show the various displays and options available. Pressing the Info button cycles through the four available displays. The default display in playback mode is image with no overlay. 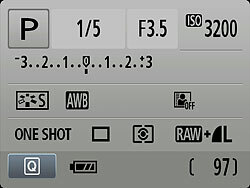 This is the second option, which shows the folder and file number at upper right, and the shutter speed, aperture, and exposure compensation (if applicable) in the upper left, while the file sequence number and total number of images on the flash card are shown below left. 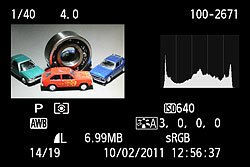 The Canon T3i's third playback display option shows a histogram and more detailed exposure information. A setting in Playback Menu 2 lets you choose between a conventional luminance-only histogram, or the separate red, green, and blue displays. If there are any blown highlights, they'll blink in this mode. 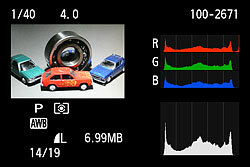 The final playback display option shows both RGB and luminance histograms side by side, along with an intermediate level of exposure information. If there are any blown highlights, they'll blink in this mode. If you press the Zoom Out button while viewing a single image on the LCD screen, it'll take you first to a 4-image thumbnail display, and then to a 9-image one, if you press it once again. The arrow keys let you navigate among the thumbnail images. Pressing the Info button in this mode overlays the same information as in the second playback display mode, for the currently selected image. You can also zoom in on an image, up to 10x at the highest resolution. Pressing the Info button in this mode overlays the same information as in the second playback display mode. The small navigator window in the lower right-hand corner shows you what part of the larger image you're currently viewing. The arrow keys let you navigate around the full image, and the zoom in / zoom out keys increase or decrease the magnification level. We like that you can step between images with the main dial while maintaining the zoomed display. 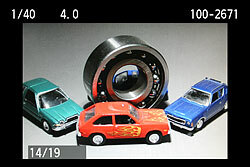 This makes it easy to compare focus or other fine details from one shot to the next. 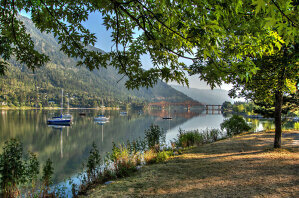 By turning the Main dial on the Canon T3i in Playback mode, you can "jump" through images in a variety of ways. An option on the Playback menu sets options of jumping through images 1, 10, or 100 images at a time, between shots captured on different dates or stored in different folders, between groups of movies, or groups of still shots. You can also jump between images by rating, either viewing only unrated images, or only those with a specific rating. The jump menu setting only applies when you're in single-image playback mode. In thumbnail display mode, the Main Dial always jumps ahead one screen of thumbnails at a time, regardless of the menu setting for the Jump option. 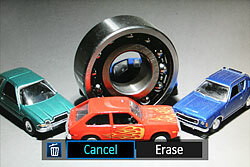 Pressing the Delete button brings up this display, giving you the option to erase the current image, or cancel out of the delete option. The Delete display will show either the full image, a thumbnail plus histogram, or a screen of thumbnails with border highlighting the selected thumbnail, depending on the playback mode you've selected.